Emergency Denture Repairs - we will come to you! DenturePoint offers a unique 24/7 emergency repair plus a free pick up and delivery service*. Your denture will be back to you within 2 hours. Just give us a call and describe how your denture broke or what happened to it. Never attempt to adjust or repair dentures yourself - you can permanently damage your dentures and over-the-counter glues may contain harmful chemicals. Standard Repairs - a free pick up and delivery*, back to you within 4 hours. Just keep all the broken pieces together and tell us how the denture broke. Adding missing or chipped teeth - we will match the shade of a missing tooth from our wide range of current stock using our tooth shade guide. 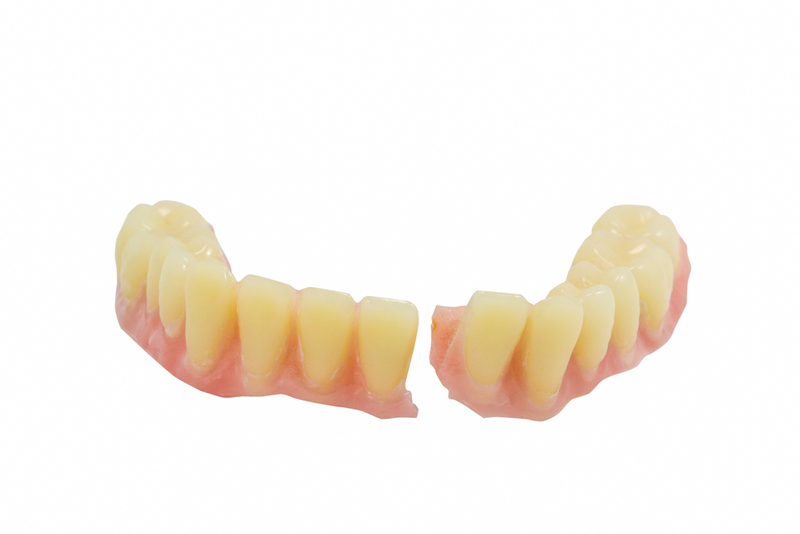 Denture Duplicating - a duplicate or a copy denture is an exact replica of your original denture. It is simply a spare set of your dentures in case of any emergency to ensure you never have to face the world without your teeth. It always gives you peace of mind knowing you have an extra set of your teeth especially when you are on holidays or simply away from home. The copy dentures are a cost effective solution - this is because we don’t need to make extra appointments. Dentures can break at the worst time - having a new set of duplicate dentures gives you more confidence in social situations. Be prepared before the accident occurs and save yourself the discomfort of being without your denture. The copied dentures will be given back to you the same day. Denture ID tags - your initials or full name will be engraved or incorporated into your denture so you can always identify it. Stain & tartar removal - professional denture cleaning that will eliminate most stains and tartar build up. Leave your denture with us and we will return it to you looking bright and sparkling clean. Denture Spa™ - another unique service brought to you by DenturePoint. Denture teeth are just as susceptible to the destructive effects of plaque as natural teeth and they need a thorough clean up to every 6 months just like natural teeth do. Once plaque hardens into calculus (tartar), it can present an irresistible invitation to bacterial problems, gum disease and irritations. It can also cause a range of digestive problems. The most recent research says that bacteria found on the dentures may even affect the heart and contribute to heart disease. Denture Spa™ will involve a thorough, professional clean up of your denture by giving it an ultrasonic bath and using the best available denture cleaning products. The ultrasonic sound waves will create a wave motion that dislodges the undesirable deposits, tartar and plaque build up. The denture will then be disinfected to remove all bacteria and other unwanted deposits. That will be followed by a thorough polishing of your denture to a high lustre. You will feel the difference the moment you put your denture back in your mouth. You are going to love it and won't believe it's the same plate. This service is recommended for every 6months - just like cleaning and scaling of your natural teeth. BEFORE and AFTER photos - click here! Custom Fitted Mouthguards - Anyone who participates in a sport that carries a risk of contact to the face should wear a mouthguard. This includes obvious sports such as football, boxing and rugby, and also collision sports where unexpected contact often happens. These include basketball, hockey, waterpolo, lacrosse, netball, baseball, softball, squash, soccer, BMX bike riding, horse riding, skateboarding, in-lineskating, trampolining, cricket (wicket keeping or battingwithout a helmet), water skiing and snow ski racing. Custom-fitted mouthguards are made by DenturePoint - we will take an impression and create a plaster model of your teeth. Custom-fitting allows a Dental Prosthetist to accurately assess your mouth and provide the best fitting mouthguard for you. DenturePoint Gift Vouchers are available - beautifully presented DenturePoint Gift Vouchers would make a perfect present for any occasion. Don’t be seen without your smile. Call us now on 0400919513 and find out how quickly and conveniently we can help.